For community pharmacists who have always been experiencing huge losses through expired products, respite has come their way, as Nearexpiry Limited, a duly registered Nigerian-based online sales and marketing company, with special interest in products with near expiry dates, recently launched its Application on Google Play Store. Speaking with Pharmanewsonline.com recently, on the concept of Nearexpiry deals, the Founder/Director, Nearexpiry Deals, Pharm. Obi Egbuonye, who was at our corporate head office, in Mende, Maryland, explained how he came about the idea from the experience he got while shopping with a colleague at a UK mall, during his last visit to the United Kingdom. Founder/Director, Nearexpiry Deals, Pharm. 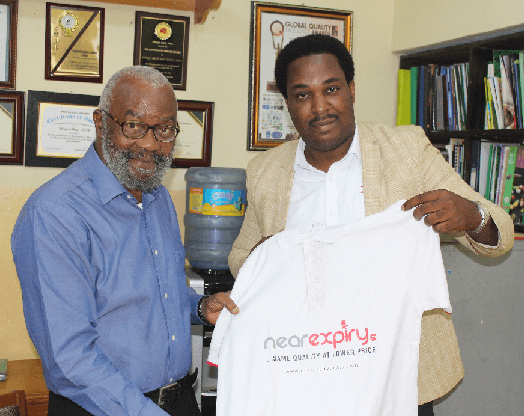 Obi Egbuonye, presenting Nearexpiry branded shirt to Pharmanews Publisher, Sir Ifeanyi Atueyi, during his visit to Pharmanews Ltd. He narrated how he would have bought the same quantity of meat at ten pounds more than the actual price he got it, at a near expiry mall in the UK. His words: “I was in the UK for my secondary school old boys’ association reunion last year, and we had to do a family carnival. In preparation, we needed to buy some foodstuffs, one of which was meat. So we went to the mall and I was going straight to the meat section, but my colleague we went together was going towards the back of the mall, and he signalled me, so I followed him. “When we got there, we saw meat in large quantity, at £ 5.99, which was to serve like fifteen people. By the time we were leaving the mall, my friend said we should check for the price of the same quantity of meat in the front section of the mall, and it was £15.99. So I asked why the wide margin in price? Then he explained that the one we bought was best before 3 days, and our carnival was the next day, so he said, what was the point of buying at £15.99, when it will be consumed the next day. So when I returned to Nigeria, I said this nearexpiry idea will be of great benefit to community pharmacists, to close the gap of losses via expired drugs. Thus, the idea of nearexpiry is extended from drugs to provisions and other consumables”, he explained. Highlighting the benefits of Nearexpiry deals to retail pharmacists and other outlets, he said first and foremost, it is a means to cut down on the inventory loss of the owner of the business. And for the man on the street, it is a plus for him too, because that item he would buy for 3X naira, he will get it for X naira. He further explained the logic behind Nearexpiry deals, stating that since retailers do not want their products to expire on their shelves, the first thing they will do is to discount their prices, so when prices are discounted, the consumer who has limited budget, on so many things will also come to buy those things because the products will still have the same quality before expiring. “It is a win win situation, for the consumers as well as the retailers”, he quipped. Although the firm is still operating through the App for now, he said the vision is to expand it into physical outlets, with branches all over the country.”Then the bigger picture is the establishment of nearexpiry physical outlets, which is for me the real thing. In the coming years, we will begin to have nearexpiry Maryland, nearexpiry Okokomaiko, with a big warehouse, where people can easily walk in to get medicines and consumables at very discounted rates. So we are going to have nearexpiry Onitsha, nearexpiry Awka, nearexpiry Ibadan, etc.,” he stated.